"Do you have a minute? "Here is your chance to re-connect with some of the folks you worship with! 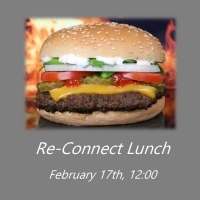 On February 17th we hope you come for lunch right after 2nd service ends. Have your choice of a chicken or beef burger, salad, and oven fries and visit with some of the people that worship along side you! Her is your chance to Re-Connect!